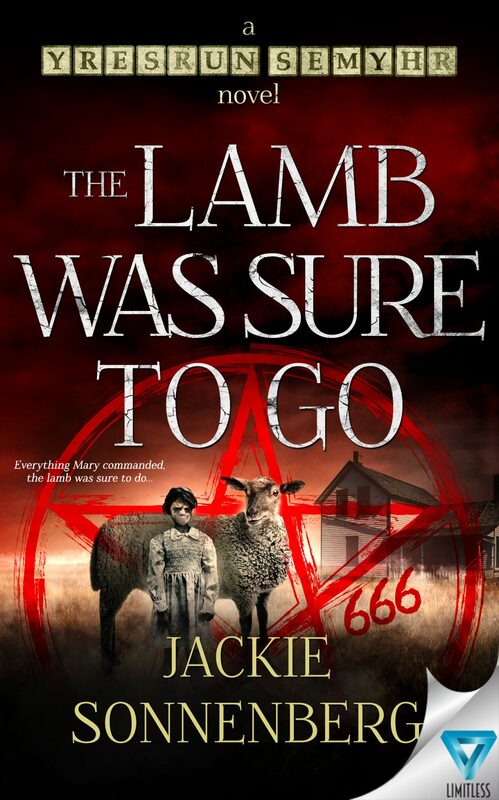 Home Author Interview Interview with author of The Lamb Was Sure To Go, Jackie Sonnenberg! Jackie Sonnenberg has done it again in the second book of her YRESRUN SEMYHR horror collection. The Lamb Was Sure To Go is a page-turner thriller that will capture the imagination of readers across all generations. The Antichrist has been born…and Father Atticus knows it. He sees visions of this evil coming to Earth to let Hell loose. Declared insane and locked up, he is helpless to the dark recesses of his mind and what is happening. Meanwhile, the Antichrist grows stronger and is already making blood sacrifices to Satan himself. Father Atticus knows it is up to him to stop it before it is too late…but how could he ever know he would be up against a little girl and her pet lamb? This suspense-filled book is sure to be the must-read of the summer with a child-character and plot that will have your hair standing on end! I am from Chicago but I now live in Orlando, Florida where I work as a haunt actor at a major interactive attraction called Zombie Outbreak. I am lucky to have a career that gives me the chance to “create scares” because it gives me proven scenarios for my books. I am one of the zombies that chases people around, and I am also tasked with writing the backstory to the attraction one chapter at a time. My writing career has also been quite successful with release of two books in my new collection, and contributions to the publisher’s short story collections. This has generated lots of invites to horror conventions, speaking on industry panels, guest appearances and book signings. I have always been fascinated with nursery rhymes and couldn’t wait to write plots and create characters based on sinister and haunted re-tellings. My book collection is called Yresrun Semyhr, and we had such a terrific reader response to the first, My Soul To Keep, that my publisher couldn’t wait for me to finish the second which is also available on Amazon. The Lamb Was Sure To Go is based on Mary Had a Little Lamb and I am even more excited about this one. After researching the original nursery rhyme, I discovered the inspirations and hidden meanings behind it. One source compared Mary and her lamb to Mary and Jesus…so I went in the opposite direction which is turning Mary into the Antichrist. She is a malicious 8-year-old girl, and her lamb serves as her beastly minion to do all the dirty work for her. Her mission in life is to serve Satan himself by bringing him blood sacrifices and release him from the gates of Hell. Of course there is someone, a clairvoyant priest, who gets the most horrific visions of the purest evil that exists, and has no idea it’s a little girl and her pet lamb. You have to read my book though to find out the rest! I have a home office that is very stimulating but working in a haunted-attraction, I make sure I have my Tablet with me at all times to jot down ideas or edit some text! I do like to venture out to coffee shops for a change of atmosphere, and I don’t know why, but there is also something about being out in a public place that gets my creative juices stirred up. Sometimes public settings enhance my writing focus too. Ideas come to me when I least expect it, like after I have had a real-life spontaneous situation during a haunt-performance. Sometimes characterization will develop from something I observe during my “people-watching” but often they are triggered by a movie or book. This happens when I am expecting a scene to unfold differently and when it doesn’t, I realize that sometimes the book just writes itself! I am captivated by the horror genre, and I am interested in how horror is done with other cultures. A good example is Rin Chupeco’s, The Girl from the Well. And of course, I’m a big fan of Apryl Baker’s Ghost Files series (as it happens, we share the same publisher!) For the most part, I like anything that is strange and messes with my head. If there is a plot twist somewhere that snuck up on me that I did NOT see coming, the author did their job! If you can’t get into the big leagues by attracting the attention of a publisher, start small. Enter short story contests. There have been several posted on Facebook lately. Start a book blog and write reviews on books. You may also want to interview your favorite authors to share their insights and learn everything you can from them! Well, I bring something fun to combine my worlds of writing and acting together: I cosplay my original characters by designing costumes and wearing them! It is a lot of fun to interact with people in character and take photos, and then they learn that said character has a story and it makes them want to read it! This is one of the best ways to market my horror properties, and it can pay off too as I won the Best Craftsmanship Award for my costume at Spooky Empire 2018!